Crested geckos (Rhacodactylus ciliatus) are lizards of New Caledonia, a set of islands situated in the middle of Australia and Fiji in the Pacific Ocean's southwestern region. Many exotic pet keepers maintain crested geckos in captivity. Dietwise, these arboreal reptiles are omnivorous. Crested geckos, family Gekkonidae creatures, typically grow to between 6 and 8 inches long. Some noteworthy physical features of crested geckos are their big heads, squat limbs, subtle scaling, narrow tails and back striping. They have two crests all the way down the edges of their backs. These crests begin just above their eyes, and look like lines of prickly scales. As pets in healthy and caring environments, crested geckos can live for 15 to 20 years. They are nocturnal animals. They tend to have meek temperaments, and biting isn't usually part of their repertories. In nature, crested geckos do eat a lot of bugs. However, they also readily consume lots of things that aren't insects. Fruit and nectar are major staples of their diets. In captivity, live insects make up big fractions of what crested geckos usually eat. Some examples of these are butterworms, cutworms, locusts and crickets. It is beneficial to gut-load crickets before offering them to crested geckos. You can do this by feeding the crickets sustenance such as oranges, carrots and grains. Nighttime feedings are appropriate for these geckos. Commercially produced crested gecko meal is a nutritious food option for crested geckos, or at least a healthy foundations for their diets. These powder-based formulas aim to give these reptiles all of the nourishment their bodies require in order to stay healthy and lively. You'll blend the powder with water and feed the paste to your crested gecko roughly three times weekly. 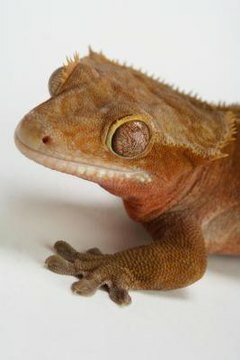 If your crested gecko eats commercial food, he does not need live insects, although you can add them as occasional treat foods. If a gecko does not consume commercial food, he might need dietary supplements in conjunction with his other foods. If you are uncertain about which commercial meals and supplements are appropriate for your pet, consult your veterinarian. Crested geckos definitely can eat non-bug food, and commercial powder food isn't the only thing they can eat in that category. In the wild, they are used to eating a lot of fruit and nectar; in captivity, they thrive when given human baby food in sweet and fruity flavors approximately two times each week. Puréed baby food formulas work well, in flavor options such as apricot, peach, pear, nectarine and banana. What Do Pet Rats Like to Eat? What Do Golden Lion Tamarins Eat?